The sun keeps shining and Nigel Evans tackled ‘Hard As Snails’ on a tough course near Guildford mid-week. No Rushmoor parkrun this week and due to multiple events at the venue they will not be restarting until Saturday 28th July. As a result Frimley Lodge Parkrun was very busy with a total of 668 runners this included 25 SJs amongst them a number of Pure Beginners who couldn’t run at Bracknell last week. Max Woods went under 20 minutes for the first time since 2016 as he was first SJ to finish. There were outright PBs for Tim Smith, Jane Pond, Kerry Gale and a course best for Blanche Barnes. At Bracknell construction of the new pavilion is taking shape and over 300 runners turned out for a hot and sunny day. Krzysztof Zielinski was first member over the finish line. Lyn Winter and Louise Shearer bagged PBs, Simon Carter recorded a new course PB and Louisa Enriquez made a first visit to the venue. On the Parkrun Tourism front we had some official club tourism this week as a group of SJs headed over to Slough for the Upton Court Parkrun near Slough. The venue was chosen by Graham Bolton who was celebrating his 50th parkrun, although Graham picked up a chest infection and couldn’t run. Its a great two lap course, starting with a gradual climb on grass near the Rugby club before a flat straight alongside the road, then a left and fast tarmac section down the extra loop which is only run on lap one which rejoins the main course and follows the stream back to the finish. This venue has the bonus of access to the Rugby club for post run refreshments. Plenty of tourism. Richard Boese was guide running at Basingstoke, John Tovell made a trip to Boston, Andy Summerskill traveled to Cambridge, Frances and Andrew Parkes headed to Barnstable. The trio of Liz Ujszaszi, Nigel Evans and Amanda Smith swapped Rushmoor for Guildford while Lisa Hale ran her fastest at Kington (and only 3 seconds off her best ever). This weeks away at home parkrunners included Yvette Glacken at Luton Wardown, John Paul Featherstone at Newbury and Sharon Conquer at Northampton. Sam Goodall had a great run at the Samaritans 10k on a trail course near Jennetts Park, Bracknell. Over at Reddam House near Wokingham recent Pure Beginner graduates Nicola Coe, Kerry Gale, Sarah Jones and Celeste Moruzzi all had great runs in the sunshine on the hilly off road course around the grounds. Later at Reddam House Jon Green and John King tackled the 10k including more ascents of ‘The Hill’. Kate Parker ran Run Or Dye at Penshurst, kent with her Mum. 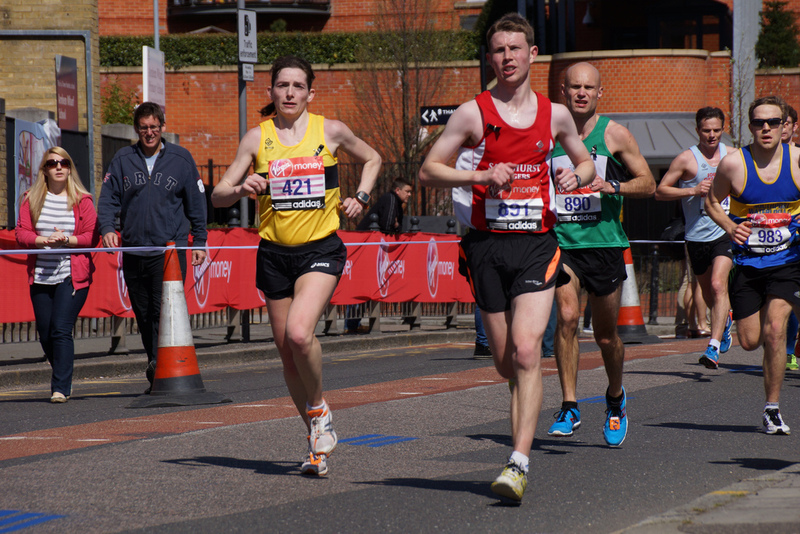 Jacqueline Hudson overcame a fall early on at the Woking Lions Charity Half Marathon. She picked herself up, dusted herself down and continued despite cuts and bruising completing the full distance to keep the Half Marathon streak going before heading to hospital for a check up! Monday: Patrick will be leading the Monday night chatfest from Sandhurst Sports Centre at 7:30pm. The route will cover approx. 6 miles and is very likely to be off road. This is one of the most sociable runs of the week and a great opportunity to catch up with friends or discuss the preceding weekend. And don’t forget the Monday Mantra ‘Mondays defo make me faster’. Wednesday: It’s the second Yateley 10k and Fun Run tonight and many members will be toeing the line in this brilliant and hugely popular (i.e. Sold Out) event. Many more members will be helping on the night and if you are free but haven’t already done so please contact Roger or Alurie and see how you can get involved. The 5-10k course will be taking a break this week. Saturday: Lots of members will be enjoying their weekly Parkrun fix at 9am on Saturday morning. Wherever you are parkrunning – Don’t forget your barcode! Remember that there will be no Parkrun at Rushmoor until July 28th. Also on Saturday is the Runnymede Relays held in Windsor Great Park. Sandhurst Joggers have seven teams each with six runners entered. Team members running legs 1, 3 and 5 will run the 5.25 mile long course with legs 2, 4 and 6 covering the 2.75 mile short course. The race starts at 12 Noon so runners are asked to arrive by 11am. Parking is at the ‘Great Park Car Park’ just off the A332 Sheet St Road.